On January 20, 2007, the 35-year-old New Haven Veterans Memorial Coliseum—better known as the New Haven Coliseum—met its end at approximately 8 o’clock in the morning as crews imploded the partially dismantled structure. Engineers used 2,000 pounds of explosives to bring down the structure and 15,000 rented tires to absorb its impact. An estimated 20,000 people attended the Coliseum’s demise. The implosion caused a brief 60-mph wind gust, and flying debris caused the temporary closure of Route 34, knocked down a utility pole on George Street, broke windows, and damaged the nearby Knights of Columbus building. Designed by architect Kevin Roche (who also planned the Knights of Columbus building), the New Haven Coliseum was built to replace the New Haven Arena, the city’s former sports and entertainment venue. 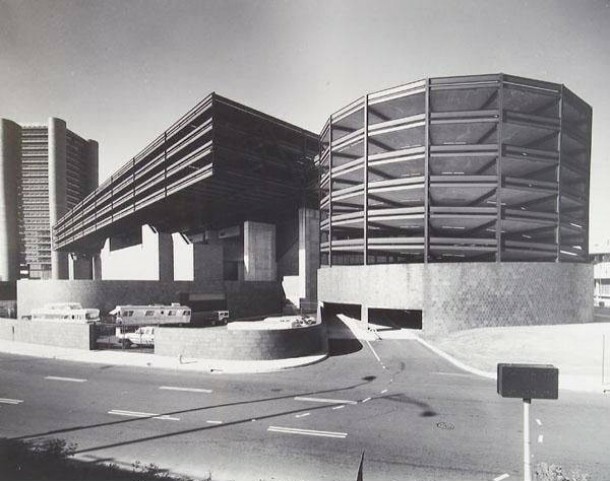 Construction on the modernist-style Coliseum began in 1968, at the tail end of New Haven’s massive urban renewal program, and was completed in 1972. Roche designed one of the coliseum’s most prominent features—its parking structure—to sit atop the Coliseum. Patrons accessed parking via a helical, or corkscrew-shaped, traffic ramp that measured a quarter-mile in length and gave dramatic form to the building’s profile. The New Haven Coliseum could hold almost 12,000 people at a time and hosted sports games and concerts, including Elvis Presley and Frank Sinatra, over the years. In its heyday hundreds of thousands of people attended events there each year.